A massive global construction boom is underway. How will it impact urban greenhouse gas emissions, and can cities ensure a greener future—both environmentally and economically—through building and energy codes? Here’s what you should know. Buildings are responsible for more than a third of global energy use and nearly 50 percent of urban greenhouse gas emissions; this exceeds 70 percent in many mature cities, including New York City and London. The global urban population will increase by 2.5 billion people by 2050. More people means more buildings. Most of the building growth will be in Africa (88 billion square meters), China (50 billion square meters), and India (44 billion square meters). There is a growing global consensus on the need for low-carbon buildings and an understanding that cities will play a key role. The Paris Agreement, C40, Architecture 2030, and the Global Climate Action Summit all include cities as key stakeholders. Individual cities, ranging from Zurich and Chicago to Guangzhou and Accra, have taken aggressive steps to update and elevate building code standards, reduce energy use, and curb CO2 emissions. Building codes have promoted minimum performance standards for health and safety since antiquity. More recently, building codes have expanded to include a focus on energy to support thriving, low carbon cities. The most up-to-date energy codes can create large benefits, reducing a building’s energy consumption up to 70 percent compared with a similar base-case building and generating large energy savings, estimated at $126 billion in the United States from 2010 to 2040. Green construction can also serve as a major economic driver in cities—low-carbon buildings in the United States accounted for 3.9 million jobs between 2015 and 2018 and contributed $23.5 billion to Canada’s GDP in 2014 alone. Successful code implementation requires ongoing performance monitoring, code refinement, and widespread adoption and compliance. And strategies needed to address CO2 emissions vary across markets. Priorities for established markets include faster retrofit cycles and increased energy-efficiency requirements for existing buildings, zero-carbon energy codes for new construction, and a transition to an all-electric future. In middle-income markets, the primary challenge is to quickly develop and implement energy codes for new construction while fostering energy-efficiency improvements in appliances and increases in local capacity for code enforcement. Developing markets need to create base energy codes to avoid locking in decades of high carbon usage in new construction and to address concerns about access to modern energy sources. Timing is important: roughly 60 percent of new construction is expected to take place in the next 20 years, and two-thirds of it is expected in countries that do not have mandatory building energy codes. 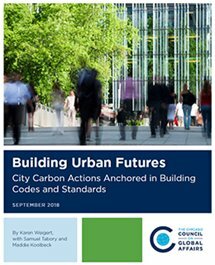 Consistent principles on aggressive, comprehensive, and enforced codes linked to broader systems can support every city on the path to a thriving low-carbon future. If energy efficiency codes fail to mandate state-of-the-art green technologies, future global energy demand will balloon by approximately 33 percent by 2050, an increase that would be catastrophic for the goals outlined in the Paris Agreement. Now you know why building and energy codes matter for future sustainability. But how can city, state, and national governments partner with the international community and private sector to meet this challenge? 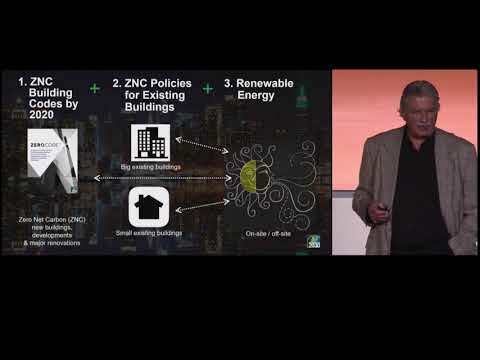 Read our new report, Building Urban Futures, published in partnership with USG Corporation, that outlines nine principles for action, and watch Ed Mazria’s flash talk at the 2018 Chicago Forum on Global Cities. Generous support for the Council’s global cities work is provided by the Robert R. McCormick Foundation.